The archeological site of Muyil is located in the northern part of the Sian Ka’an Biosphere Reserve. 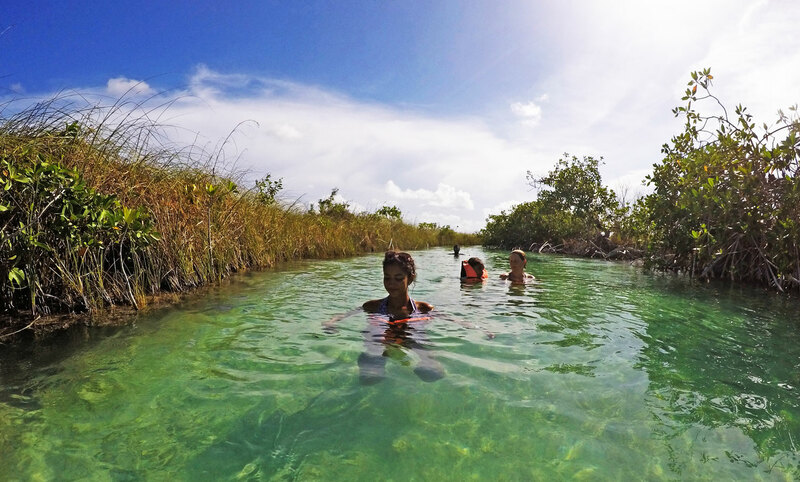 From the archeological site we take a trail towards the tallest observation point of Sian Ka’an to admire the exuberant vegetation of the jungle and the freshwater wetlands. Once we reach the Muyil lagoon, we take a boat across two lagoons connected by an artificial canal that has been in use for many centuries. Xlapak is the name of the building at the beginning of the lazy river and the start of an incredible floating experience in crystal clear water on its way to the Caribbean Sea. We float for over 30 minutes surrounded by mangroves, orchids, bromeliads and cacti while listening to the sounds of nature. A delicious vegetarian picnic with seasonal fruits is included in the tour. Shared expeditions (min 4 people) run Mondays, Wednesdays and Saturdays. Private expeditions run every day. Kids pricing is $118 usd/pp. Please indicate your preferred language when inquiring. Note: private expedition price per person decreases for larger groups. A charming ancient Mayan village located on a small lake. Strap a life jacket on and let the calming river do the rest.